And then working through the process with dOT and CSX to get an at-grade rail crossing was very time consuming process. And them fnding funding to get the rail spur in the ground before you have an end user that wants to actually operate a business out of there has been a challenge. Now all of those pieces are falling into place and it just takes time. 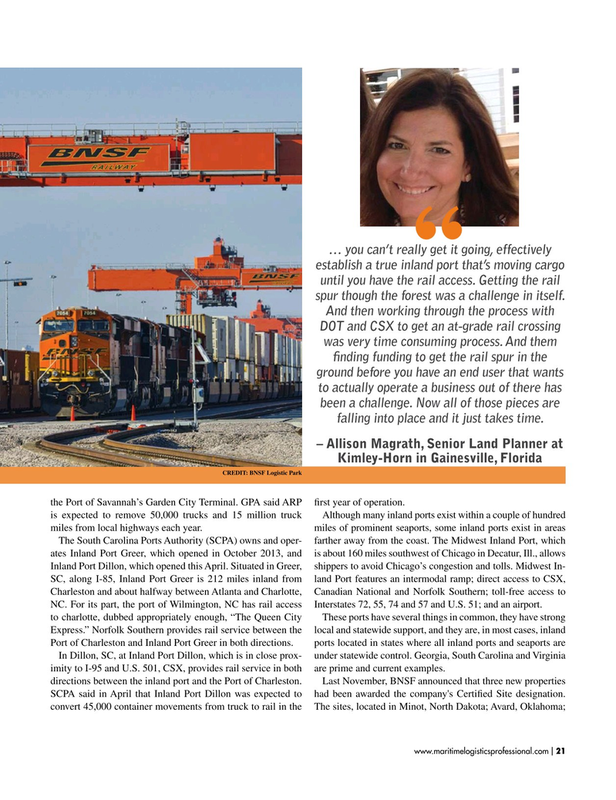 CREDIT: BNSF Logistic Park the Port of Savannah’s Garden City Terminal. GPA said ARP frst year of operation. In Dillon, SC, at Inland Port Dillon, which is in close prox- under statewide control. Georgia, South Carolina and Virginia imity to I-95 and U.S. 501, CSX, provides rail service in both are prime and current examples.